Telegraph photo by TOM KING Nashua North-Souhegan goalie Colin Duckless thwarts Nashua South's Nolan Foss on a break-in during Monday night's Battle of the Bridge at Conway Arena. NASHUA — They are becoming the Kings of Comebacks. 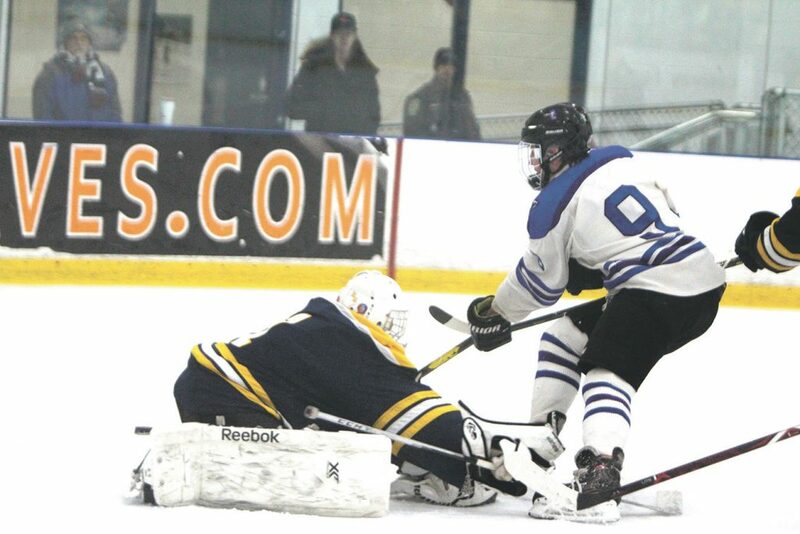 The Nashua High School South-Pelham hockey team lately hasn’t gotten rattled trailing by multiple goals. 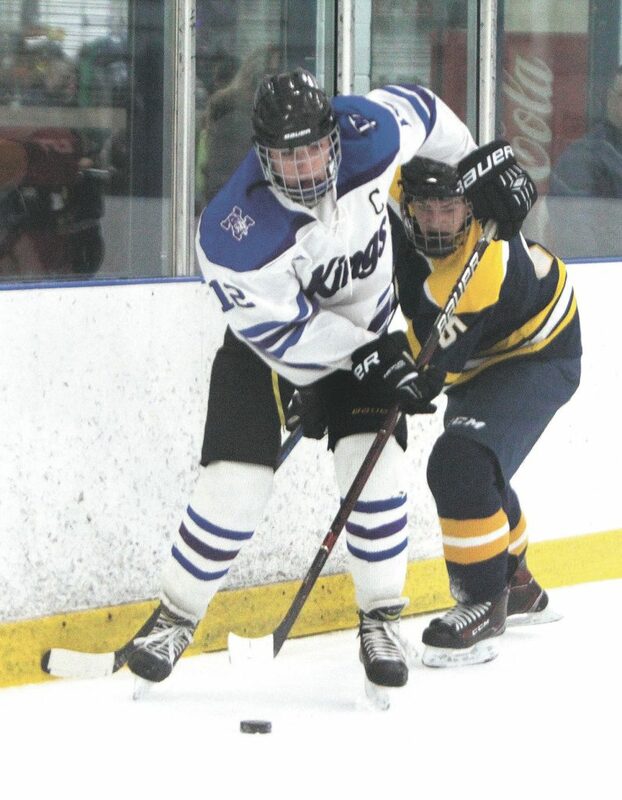 They rallied from a three goal deficit the other day to beat Alvirne-Milford, but Monday night was even more special for them as they overcame a 2-0 start to top arch rival Nashua North-Souhegan, 4-2, in the Battle of the Bridge at Conway Arena. The intensity was at a high level in front of a loud crowd. South-Pelham’s third straight win leaves them at 6-6 – equaling last year’s win total — but this had to be a tough seventh straight loss for the 2-9 Saber-Titans, who came within inches of taking the lead just moments before Pinksten’s goal, as Kings netminder Nate Serrentino robbed. North-Souhegan’s Jared Egersheim, who had his own shorthanded beakaway, and then again on a followup shot. After his second save (he had 18 overall), he shot the puck up to Brandon Rheaume, who fed Pinksten. 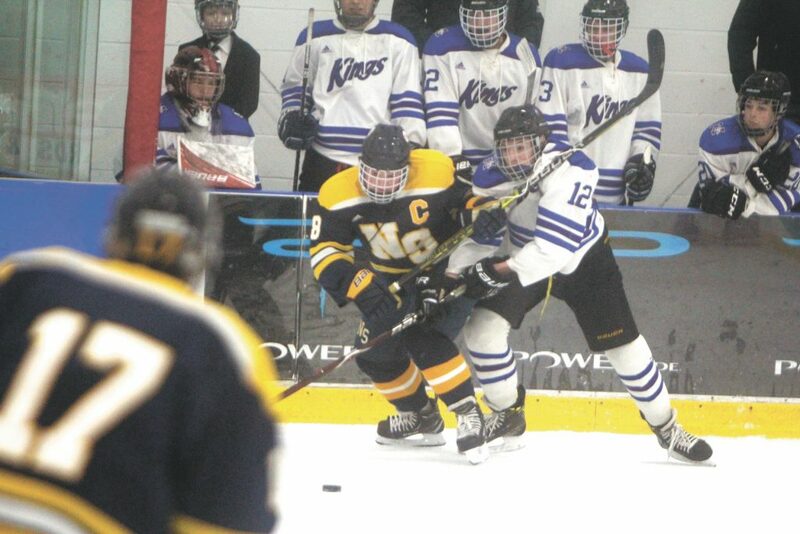 Telegraph photo by TOM KING Nashua North-Souhegan's Brandon Hugh (8) battles Nashua South-Pelham's Joe Moore for the puck in front of the Kings bench during Monday night's Battle of the Bridge at Conway Arena. He hopes for a different story in the rematch in three weeks. But in this one, one good breakaway deserved another. Telegraph photo by TOM KING Nashua South-Pelham's Jloe Moore (12) gets to the puck ahead of Nashua North-Souhegan's Ryan Dancoes along the boards during Monday night's Battle of the Bridge at Conway Arena. But it wasn’t completely over until South-Pelham’s Joe Moore beat Duckless (27 stops) breaking in again with 43 seconds left for the insurance goal. The Saber-Titans took advantage of the Kings’ penalty problems in the first period with two goals by John Natale just over a minute apart. The first was a wrister that beat Serrentino, assisted by Brandon Hugh, at 5:44 with the teams skating a 4 on 4. The second was unassisted on the power play at 6:24 to give North-Souhegan a 2-0 lead. Indeed, the second period belonged to the Kings. Josh Kinghorn beat Duckless, assisted by Joe Moore at 1:48, and then Brandon Rheaume then tied it at 11:34, assisted by Kinghorn and Moore.